Research Skills Guides - Research Now! HuskyCT: Integrating Library Resources — Research Skills Guides - Research Now! Research Now! is a series of guides designed to be used within courses to engage students in foundational information literacy concepts. Our Research Now! guides have been created to be flexible and modular, allowing instructors to integrate them into courses at their point of need. Instructors' Guides, including information on how to use these guides to encourage and develop information literacy skills and habits of mind, are being developed. What's Available in Research Now? Full Guides, Single Pages, or individual Content Boxes can be embedded into a course. Follow these First Steps, then choose the appropriate tab for embedding a full guide, a page, or a box. 3. Give the page a name. Other information is optional. Click Submit when finished. 4. Open the new page just created and select the Library's LibGuides site: LibGuides - guides.lib.uconn.edu. To embed an entire guide, follow steps 1-4 in the First Steps tab. 6. Select the guide from the menu. If you know the name of the guide, start typing to navigate more quickly. If not, browse to find the desired guide. 7. Select Embed. The guide is now embedded in your HuskyCT course! 7. 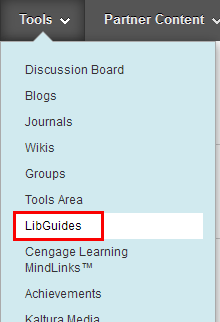 Choose the Guide Page and Box (Box option will be available only if embedding a content box). 8. Select Embed. The page or content box is now embedded in your HuskyCT course!